For many years, the City of Edina has been known to be one of the most affluent suburbs of Minneapolis. Major highways run through the area making it easily accessible to all within the metropolitan area. Whether you are shopping on the posh stretch of France Ave or relaxing at one of the 44 grassy parks, Edina has activities for all to dive into. Edina is known for its charming neighborhoods and extravagant homes. In 2009, the estimated median house value was about $387,974. Housing styles vary in each neighborhood. Near France Ave, you will find quaint Cape Cod and unique split level homes with recent values at about $300,000 to $400,000. More luxurious neighborhoods are found near the cities country clubs with beautiful Tudor, European, and French Country style homes starting at $800,000. Finding the perfect home in Edina is much easier with local expertise so you can find the perfect home that matches your preference in neighborhoods, communities, and lifestyles. The city of Edina has a total area of 16.0 square miles. The city’s largest proportion consists of residential areas. You will find a variety of neighborhoods within Edina including Indian Hills, Morningside, Country Club District, Interlachen, and Parkwood Knolls. According to the 2000 census, there were 47,425 people residing in the city. Two private country clubs serve the area; both offer plenty of amenities for members. Edina has many retail shopping centers, including Southdale Center and the Galleria. The city shares a successful commercial area with Minneapolis known as “50th & France.” Here you will find trendy boutiques, gourmet restaurants and so much more. Edina is also home to the headquarters of Lund Food Holdings, Regis Corporation, and of Dairy Queen and Orange Julius. The out-and-about lifestyle of Edina supports local businesses in all industries. Edina was settled by Irish and Scot families in the mid-1800’s and was known as the Edina Mill community. A little red mill was built in 1857 on Minnehaha Creek and was the beginning of a rural village that grew around it. Originally Edina was part of Richfield Township but in 1888 the Village of Edina was voted its own identity. In 1956, the nation’s first enclosed shopping mall opened, known as Southdale. 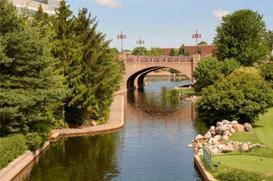 Today, Edina is known for its successful business community, renowned school district, and award-winning public parks. Edina is served by award winning Independent School District 273 which includes six elementary schools (K-5), two middle schools (6-9), and one high school (10-12). Approximately 8,300 students are enrolled in Edina Public Schools. In addition, three reputable private schools are located in Edina: Our Lady of Grace (k-8), St. Peters Lutheran School (PK-4, 6-8), and Calvin Christian School (K-8). The City of Edina, MN is located in Hennepin County, about eleven miles southwest of Minneapolis. The city can be accessed from Minnesota State Highway 62 and 100, U.S. Route 169, and Interstate 494. 169 and 100 extend north to south while 494 and 62 extend east to west.